What Wine Goes Best With a Chocolate Bunny? 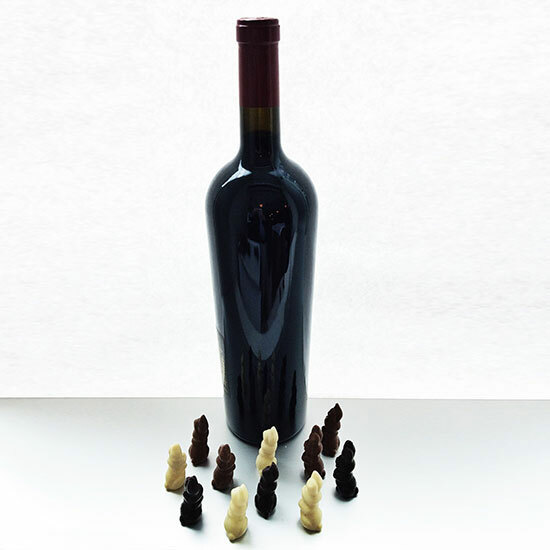 What wine goes best with a chocolate bunny--or any kind of chocolate, really? Anyhow, that being the case, it seemed vitally important to me to determine exactly what kind of wine really does go best with a chocolate bunny. The following were uncorked and taste-tested in the F&W Tasting Room, together with a number of truly excellent (and still available for Easter, I should point out) Jacques Torres chocolate bunnies. Unfortunately, the bunnies did not survive the tasting process intact. Just plain awful. Turns the acidity of the wine into a dentist’s drill inside your head. Zero fun. Up there with Syrah and mackerel sushi as one of the all-time godawful pairings. People often want to pair chocolate and Cabernet, but both the dark and milk chocolate bunnies made this luscious Cabernet taste sour and harsh. Feh. Proof once again that Cabernet and chocolate is a marriage made in hell. Better than the above but still no real joy. The sharp acidity of the Tokaji is jarring with chocolate. Makes you wince. I had hopes, but they were dashed. A passion fruit tart would have been great, though. Finally, something that works—and about time. The tawny port brings out the creaminess and vanilla notes in the milk chocolate, which in turn makes the tawny brighter and more nutty—excellent combination. Not as good with dark chocolate but still fine. The opposite of the tawny: The Graham’s was great with the dark chocolate, intensifying the chocolatey-ness, making its flavors even richer, while the light bitterness of the chocolate balanced the fruit and sweetness of the wine. Home run. Not as good with the milk chocolate, though. The takeaway: Regardless of whether you buy your chocolate in bunny form, dark chocolate is generally better with fruity, intense dessert wines like Port, Banyuls, Recioto della Valpolicella and so on. Milk chocolate loves caramel/toffee/nutty dessert wines, like Tawny Port, Australian Muscats, sweeter oloroso sherries, Malmsey Madeiras and so on. Save your Tokajis for fruit tarts, your Cabernets for steaks, and if you serve Sauvignon Blanc with a big bar of chocolate, it’s not my fault if you go screaming off into the hills. Wittgenstein would agree with me on that one.